Background : It is now known that the disease process of diabetes has effects on various tissues of the body. The following study was done to analyze the effects of diabetes on oral tissues. Aims : To study the morphology and cytomorphometry of the cells obtained in cytologic smears from the buccal mucosa of diabetic patients. Materials and Methods : Smears were obtained from clinically normal buccal mucosa of 50 randomly selected diabetic patients attending the diabetic clinic and the out-patient department and of five healthy subjects as control. 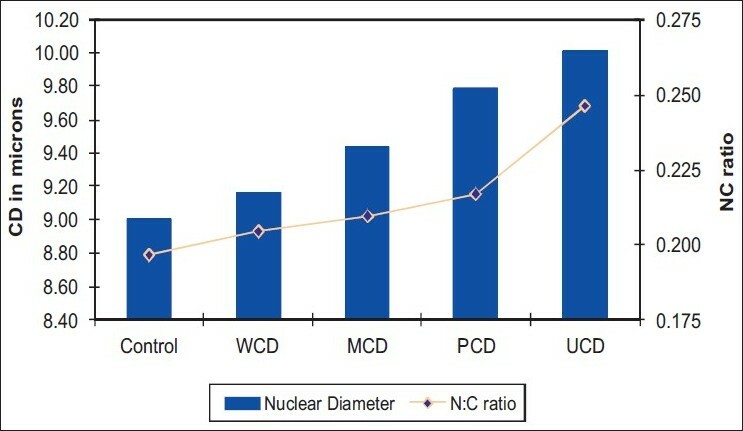 Smears were stained using Papanicolaou method, and using a micrometer mean values of nuclear diameter (ND), cell diameter (CD), cytoplasmic diameter (CyD) and nucleus: cytoplasm ratio (N: C ratio) were obtained for each patient. Diabetic patients were divided into four groups based on the glycosylated hemoglobin (GHb) values for comparison. Statistical analysis used : Student's T-test and Fisher's F-test. Results : Statistically significant increase in ND (P=0.0367) was found in diabetic patients compared to controls. Degree of glycemic control significantly affected ND (P=0.0042) and N: C ratio (P=0.0055). In general, as the severity of diabetes increases, ND and N: C ratio rise gradually. Conclusions : Diabetes produces definite morphologic and cytomorphometric changes in the buccal mucosa of patients. However, further research in this direction is indicated, to analyze the significance of these findings as a tool for diabetes detection, as well as to obtain deeper insights into its effects on various tissues. 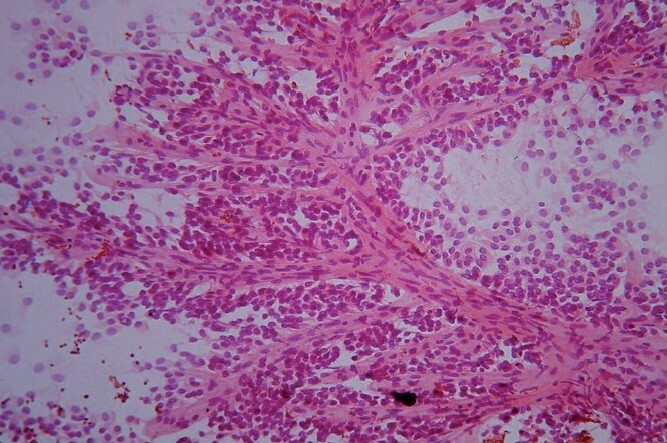 Background: Solid pseudopapillary tumor is a rare pancreatic neoplasm with uncertain to low malignant potential. This is an uncommon neoplasm with many pseudonyms, occurring predominantly in young woman under the age of thirty years. Aims: To study the cytomorphological features of six cases of solid and pseudopapillary epithelial neoplasm of pancreas diagnosed on fine needle aspiration cytology (FNAC) in years 2005 to 2007 and its cyto-histological correlation. Materials and Methods: Image-guided FNAs was done in these six patients preoperatively. Alcohol-fixed smears were stained with Papanicolaou stain, cytomorphological findings were evaluated and diagnosis was made. Diagnosis was later confirmed by histology in all cases. 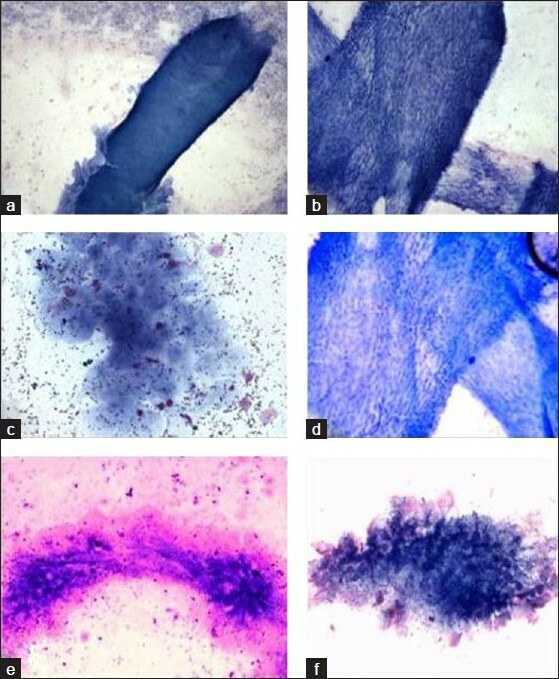 Results: All six cases show characteristic cytological features such as hypercellular smears with presence of abundant delicate papillary fragments, dyscohesive cells, monomorphic tumor cells with delicate folded nuclear membranes, and foamy macrophages in the background. Conclusions: Preoperative correct diagnosis of solid pseudopapillary tumor of pancreas is possible on FNAC and by doing so it helps in management of this surgically curable neoplasm. Background: Cysticercosis is more common than usually thought. Fine needle aspiration cytology (FNAC) plays an important role in prompt recognition of this disease. Aims: To study the role of FNAC in the diagnosis of cysticercosis. Materials and Methods: Twenty-two patients with subcutaneous and intramuscular nodules, who were clinically diagnosed as tuberculous lymphadenitis, reactive lymphadenitis, lipoma, neurofibroma and cysticercosis were included in the present study. Results: In nine cases, a definitive diagnosis of cysticercosis was obtained in the form of fragments of parasite bladder wall and, biopsy confirmed the diagnosis. In the rest 13 cases, larval fragments could not be identified on the aspirates and the diagnosis of parasitic inflammation was suggested on the basis of other cytomorphological findings. Follow-up biopsy confirmed the diagnosis of cysticercosis. Conclusions: FNAC in cysticercosis is a low-cost outpatient procedure. 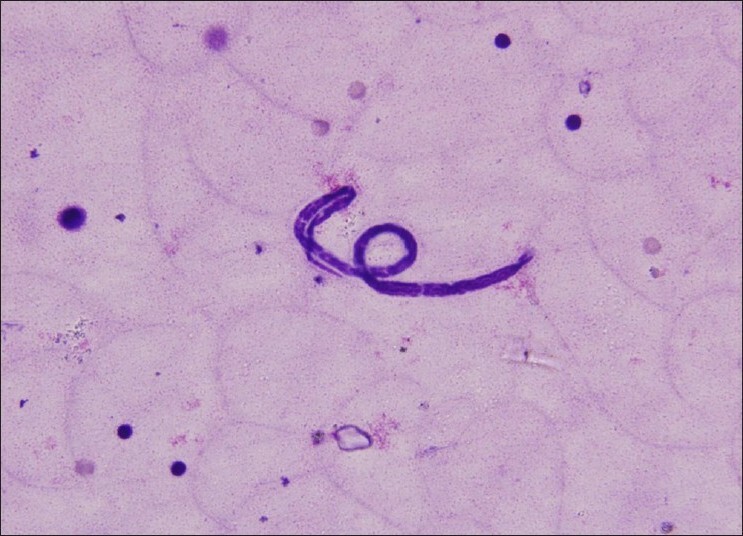 The cytological diagnosis is quite straightforward in cases where the actual parasite structure is identified in the smears. However, in other cases, presence of eosinophils, histiocytes which may be in palisaded clusters or not, a typical granular dirty background, etc., are the features which should always alert the pathologist to this possibility. Aim: Our study aimed at a cell pattern approach to interpret thyroid cytology and to demonstrate diagnostic accuracy of fine needle aspiration cytology (FNAC) with an emphasis on diagnostic pitfalls. Materials and Methods: A total number of 218 goitre cases, from the year 2000 to 2004, were reviewed retrospectively from the cytology files, without considering the previous cytological diagnosis. Four cases with inadequate aspirate were excluded. The predominant cell pattern, such as macro/normofollicular, microfollicular, papillary, syncytial, dispersed and cystic pattern, was noted in each case. The final diagnosis was arrived by observing the cellular details and background elements. 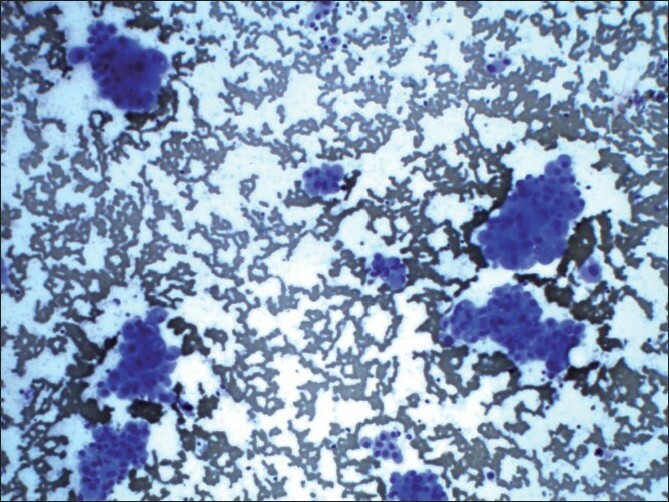 Cytological diagnosis was correlated with histopathology in 75 cases. The sensitivity and specificity were computed. Results: Normo/macrofollicular pattern was seen in 71.96% of nodular goitre and 6.9% of follicular neoplasms. Around 86.2% of follicular neoplasms and 17.6% of papillary carcinoma had microfollicular pattern. The papillary pattern was seen in 47% of papillary carcinoma. Syncytial pattern was noticed in 72.3% of chronic lymphocytic thyroiditis and 29.4% of papillary carcinoma. 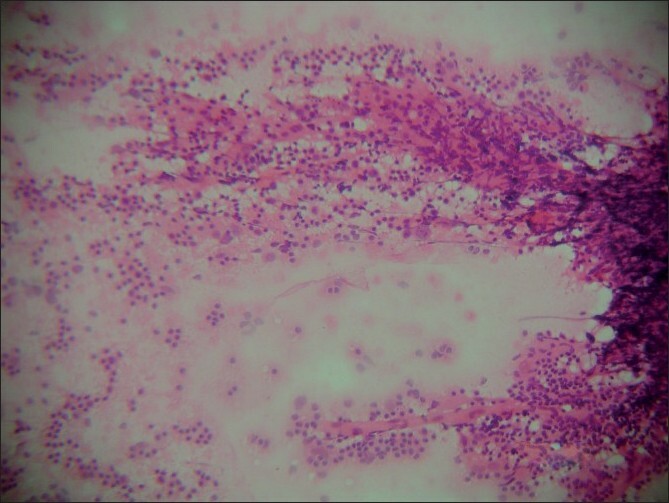 Cytological diagnosis was concordant with histopathological diagnosis in 65 cases. Overall sensitivity and specificity of FNAC in diagnosing neoplastic lesions of thyroid were 83.33 and 95.55%, respectively. Conclusion: FNAC is more sensitive and specific in triaging neoplastic from non-neoplastic thyroid lesions. 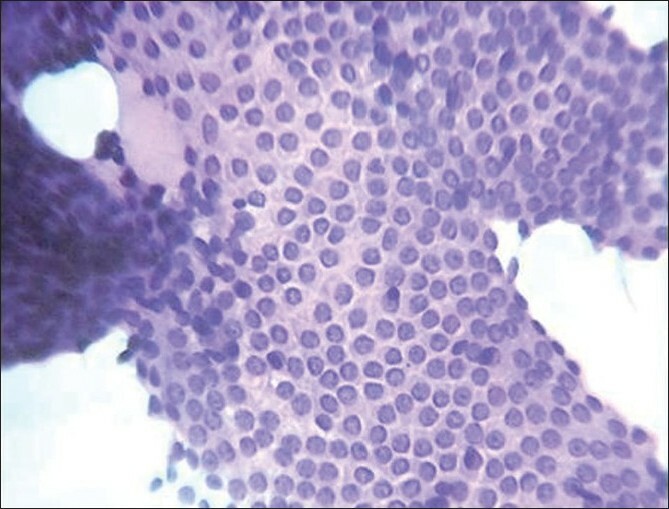 Identification of the predominant cell pattern would be complementary to analysis of cell morphology and background details in cytological diagnosis of thyroid lesions. This approach helps to diagnose follicular neoplasm and follicular variant of papillary thyroid carcinoma. Eumycetoma is a chronic cutaneous and subcutaneous infection caused by various genera of fungi producing specific colored granules known as grains. A 45-year-old farmer presented clinically with a left foot mass with multiple discharging sinuses existing for last 3 years. Clinical and radiological findings suggested a diagnosis of chronic osteomyelitis with suspicion of tuberculosis. Imprints plus fine needle aspiration cytology (FNAC) smears exhibited distinct brown-black colonies of a fungus having branching and septate hyphae embedded in matrix like material against a mixed inflammatory background. 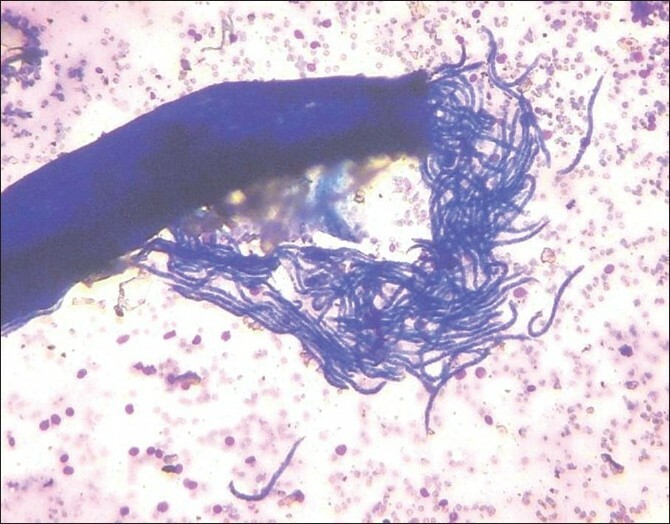 Periodic acid Schiff (PAS) stain gave positive staining and subsequent fungal culture confirmed the cytological diagnosis and aided in species identification as Madurella mycetomatis. Thus, eumycetoma can precisely be diagnosed and confidently differentiated from similar conditions such as actinomycetoma by simple and inexpensive cytological techniques such as FNAC and imprint smears, employing routine May-Grόnwald-Giemsa, Papanicolaou and simple PAS stains on cytological specimen, thus leading to rapid diagnosis for institution of correct treatment. 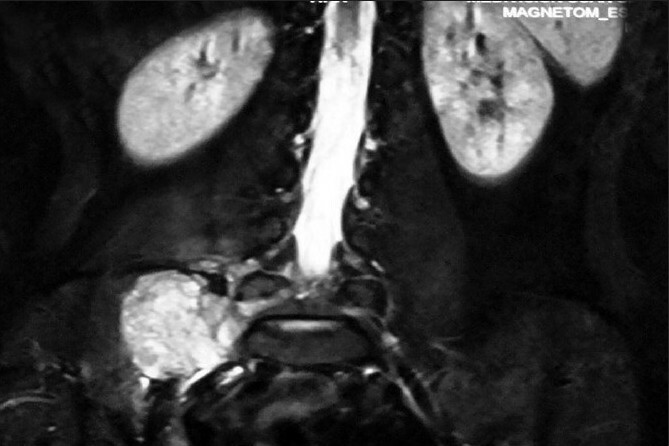 The occurrence of retroperitoneal schwannoma is uncommon and its presence may only be expressed by insidious onset of nonspecific symptoms such as vague abdominal pain. Imaging modalities like computed tomography and magnetic resonance imaging may demonstrate the tumor, but due to heterogeneity and degeneration in some tumors, it may mimic malignancy. So, fine needle aspiration cytology followed by tissue sampling through needle biopsies may be essential to confirm the diagnosis prior to the surgery. This case is reported for its rare clinical presentation, having duration of more than 40 years with cystic degenerative changes. The low incidence and the non-specific clinical symptoms led us to conclude that the diagnosis of a sebaceous carcinoma of the eyelid often occurs very late. Sebaceous carcinoma of the ocular adnexa is a malignant neoplasm which can exhibit aggressive local behavior, can have pagetoid spread and can metastasize to regional lymph nodes and distant organs. The neoplasm is known to masquerade as other benign and less malignant lesions, and has relatively high morbidity and mortality. Scrape cytology was done in a 70-year-old female with a tumor in left upper lid. 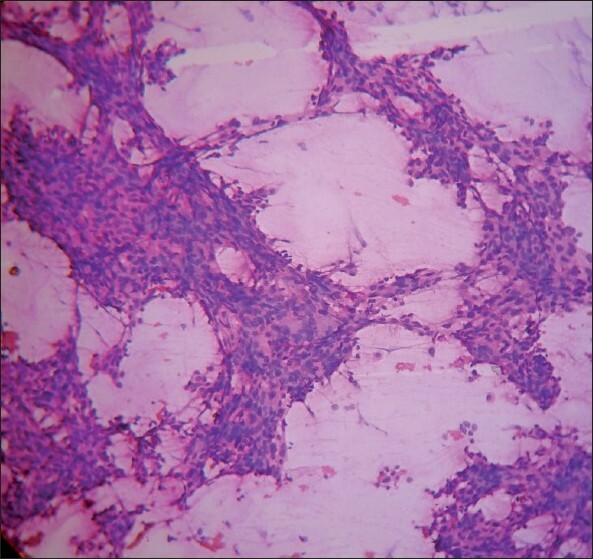 Cytological smears were suggestive of sebaceous carcinoma. Subsequently, histopathology confirmed the diagnosis of sebaceous gland carcinoma. The article highlights the role of scrape cytology in early diagnosis and subsequent appropriate surgical management of eyelid sebaceous gland carcinoma, to prevent recurrence and metastasis. The use of the term "Hürthle cell neoplasm" as the gold standard should be discouraged as it makes evaluating these lesions more confusing. Recently, a number of studies have been conducted to define criteria that are more specific for Hürthle cell carcinoma (HCC). We herein report two cases of HCC of thyroid which were accurately diagnosed preoperatively using various cytological features described in the recent studies. A review of the literature is also presented. Extraskeletal Ewing's sarcoma (EES) is a rare tumor. Paravertebral Ewing's sarcoma requires more extensive therapy as compared to Ewing's sarcoma of bone. Fine needle aspiration cytology (FNAC) plays an important role in the early diagnosis of these cases. We present a case where paravertebral extraosseous Ewing's sarcoma was diagnosed on FNAC in a 19-year-old girl. 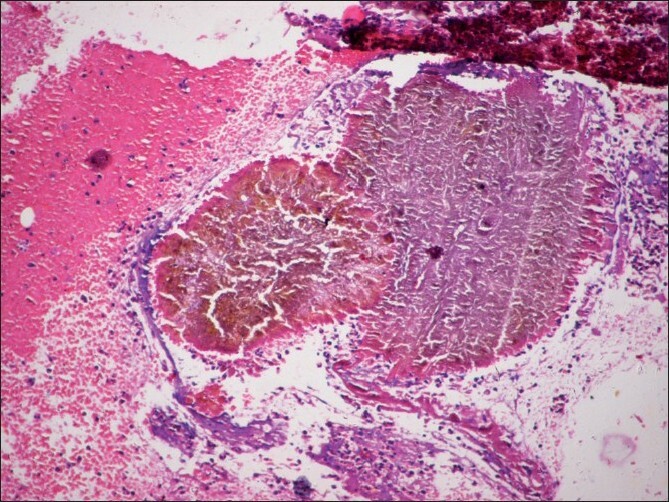 Osseous differentiation within a phyllodes tumor is extremely rare. 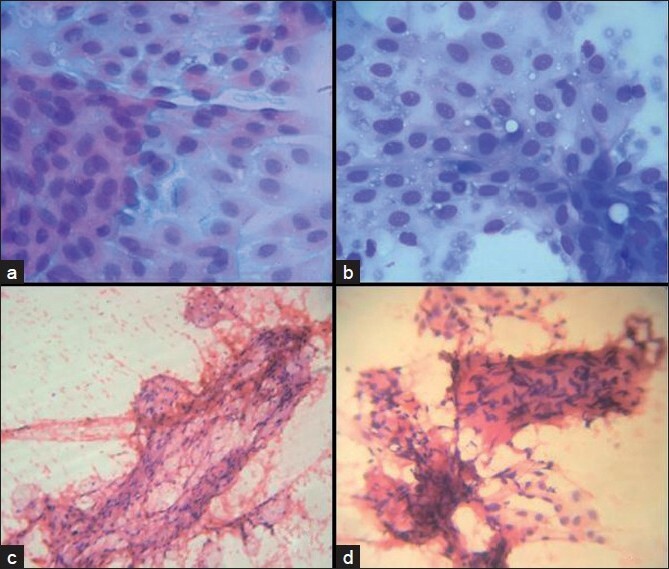 Cytological and histological findings of a case of malignant phyllodes tumor with osseous differentiation are presented. A 45-year-old female had a malignant phyllodes tumor with osseous stroma diagnosed by fine needle aspiration cytology. The cytological findings were representative of the histological features. The diagnosis of these tumors preoperatively is important in planning the most appropriate treatment. It is also important to follow up these patients postoperatively for long periods for recurrence and metastasis. Castleman's disease (CD), also called giant lymph nodal hyperplasia, is a lymphoproliferative disorder secondary to lymphoid follicle hyperplasia and marked capillary proliferation with endothelial hyperplasia. It presents as enlarged lymph nodes in the mediastinum, neck, groin, axilla and other sites. On clinical examination as well as gross examination, this disease mimics lymphomas and tuberculosis. 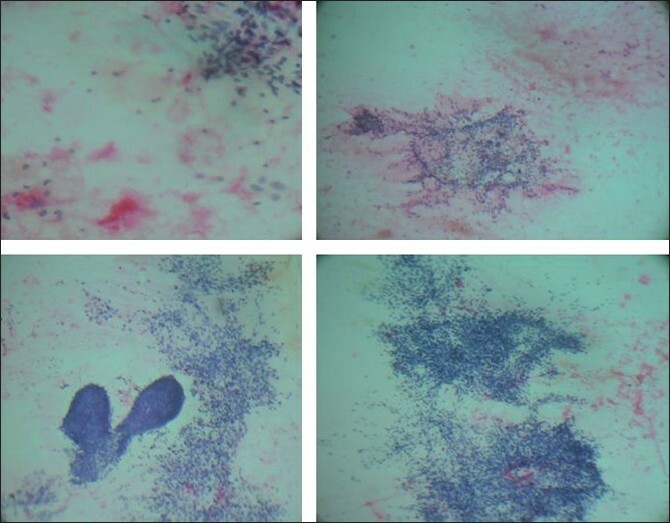 Since cytological appearances vary depending on the type and extent of hyperplasia, fine needle aspiration cytology (FNAC) findings may not always be conclusive in all cases. We studied aspirates in two cases of CD, one of which presented with multiple enlarged axillary lymph nodes and the other with enlarged cervical lymph node. Cytology revealed reactive lymphadenitis with hyalinized capillaries and other features. Lymph node excision in both cases confirmed the diagnosis.